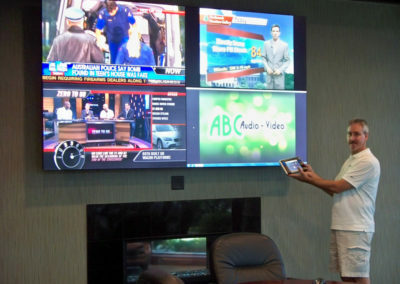 At ABC Audio Video we design, sell and install audio and video systems in both new construction and existing buildings. We offer good, practical ideas for your specific project and never over sell or over complicate. No project is too big or too small. We ask questions, listen, and then offer simple, practical and intuitive solutions based on your needs, wants and budget. 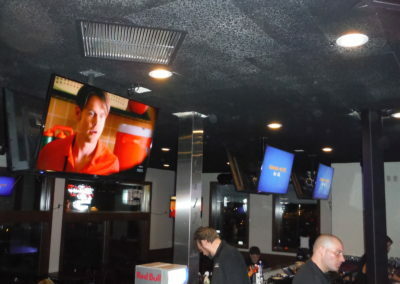 For over 10 years, ABC Audio Video has provided affordable audio and video solutions to commercial customers of all sizes, from hospitals, to restaurants, law firms, government, financial firms and institutions, schools and more including organizations like Milwaukee Admirals, Milwaukee Wave, Froedtert Hospital, Community Memorial Hospital, Elmbrook Hospital, TGI Fridays, UWM Athletics Department, the Pfister Hotel and many other businesses throughout southeastern Wisconsin. 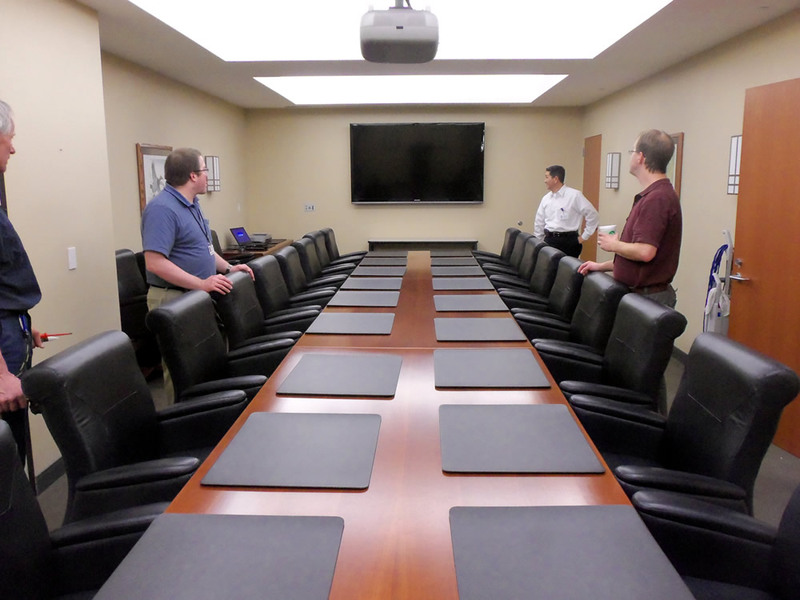 Conference and training room upgrades: Replacing outdated projectors with wall mounted TVs or modern, professionally-hung projectors. 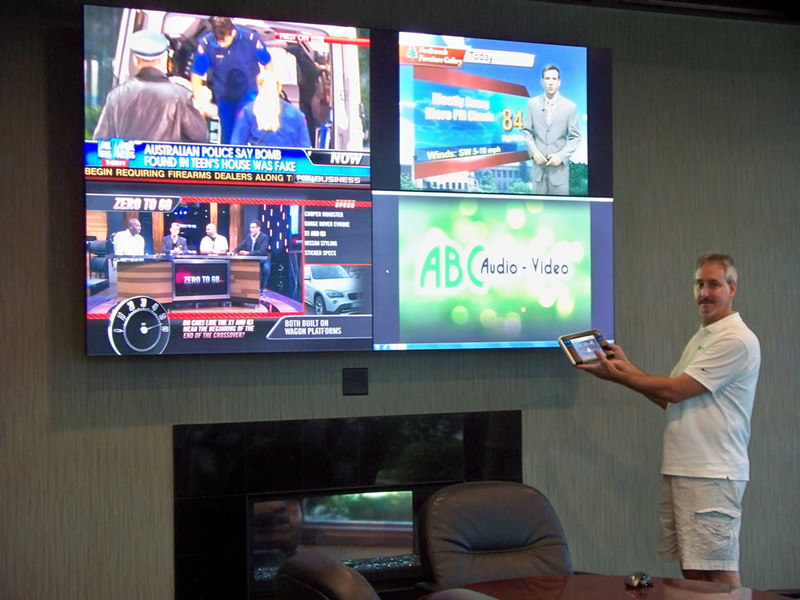 A/V upgrades for remodeled spaces: Assistance configuring Wi-Fi, running data wire, hanging TV’s, and more. 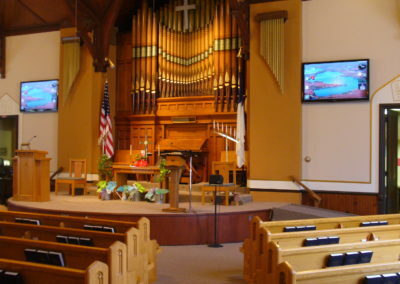 Music and speakers: Installation of speakers for background music or privacy/sound masking in offices, restaurants, waiting rooms, churches, radio stations, manufacturing production shops and more. We keep it simple and make sure it’s done right the first time. 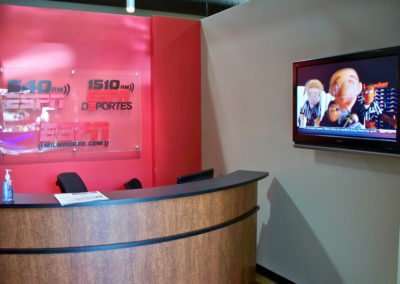 Whether you simply need a TV mounted, or a fully equipped training center, we can help. We ask the right questions to ensure your needs are completely met. 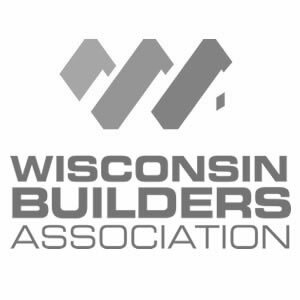 With 10+ years of experience servicing businesses throughout Wisconsin, we make sure your project is simply done right. 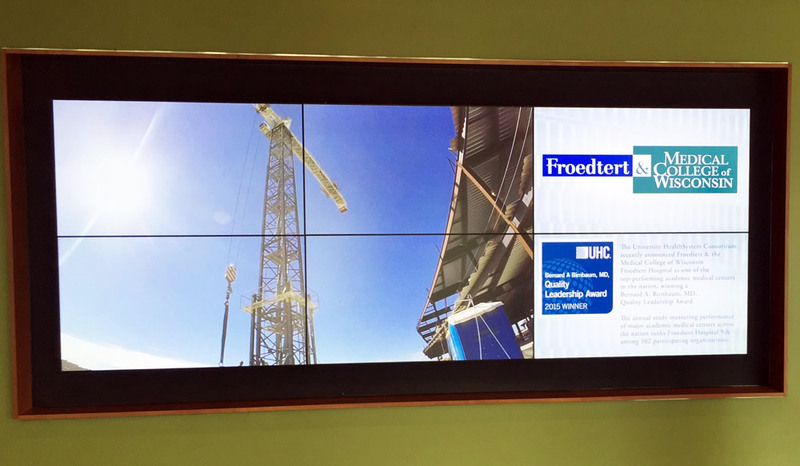 Choosing the right TV size for your space is important for achieving the ideal audio/video experience. 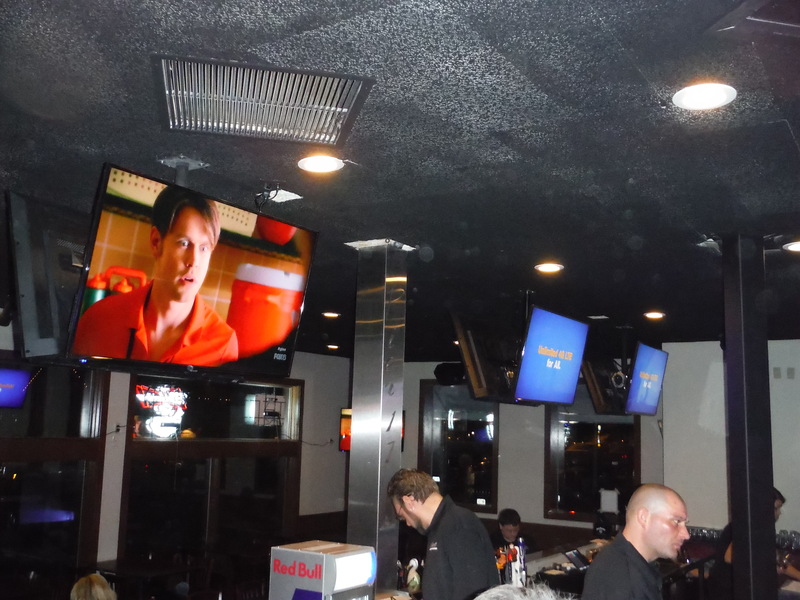 For this reason, we help you select the optimal screen size and placement for your space, based on a number of important factors, such as room size, ceiling height, and room configuration. 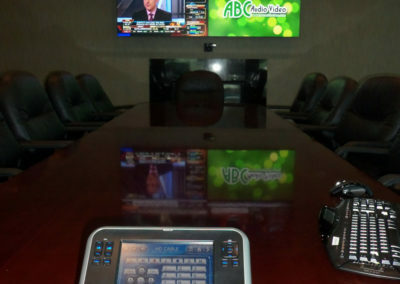 Installation services include mounting TVs, running HDMI cables for laptop, PC, or tablet connections, and assistance configuring simple video conferencing solutions for your presentation and training needs. Wireless options are also available. 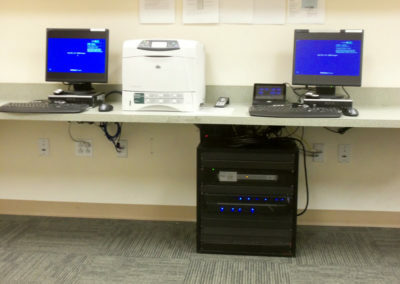 In addition, we can also provide data, phone, and audio/video wiring for new construction or existing buildings. Projector and screen technology has rapidly changed over the years. 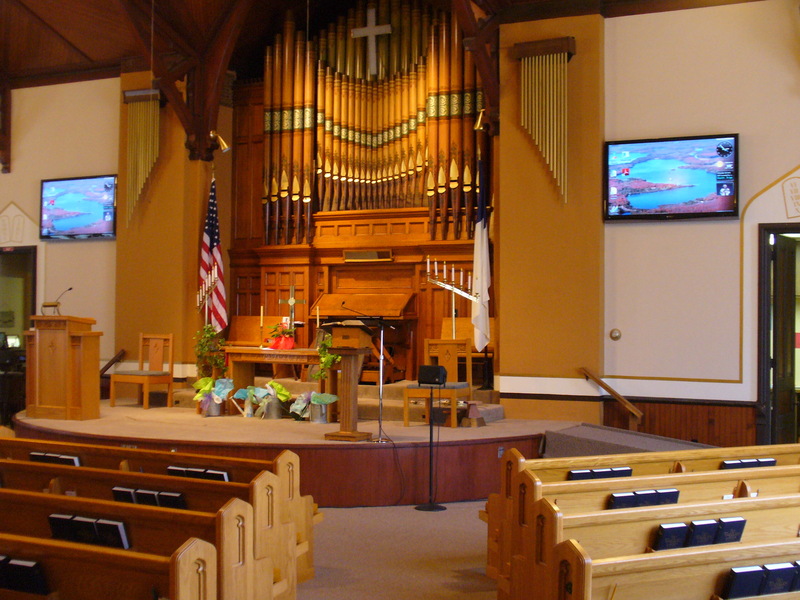 Based on our extensive experience, we will assist you in selecting the optimal projector/screen for your space and unique set of needs. In addition, we also provide recommendations on equipment, size, and placement, based on factors like lighting, room size and more. 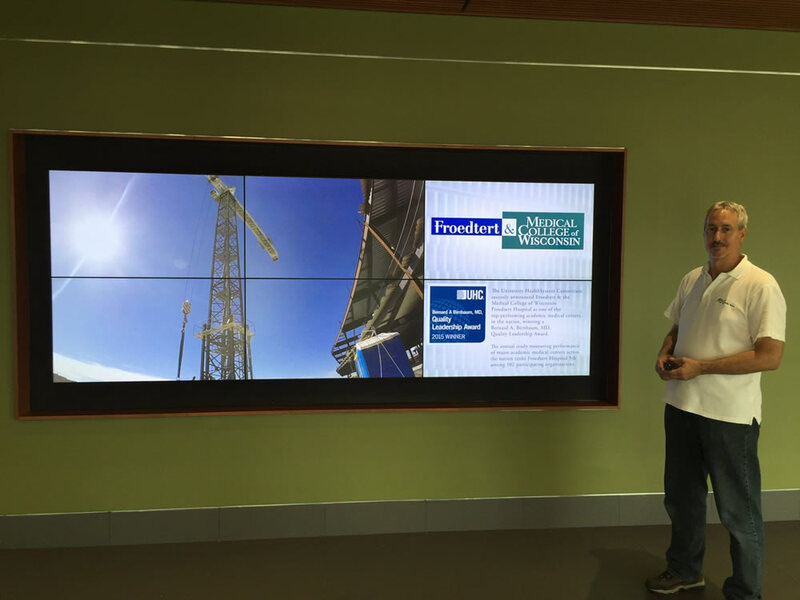 Installation services include data, phone, and audio/video wiring for new construction or existing buildings, projector and screen mountings, running HDMI cables for PC, laptop, or tablet connections and simple video conferencing solutions. 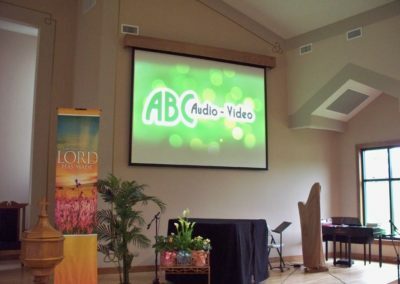 ABC Audio Video can assist with all your sound enhancement needs – from wired and wireless microphones, to mixers/amplifiers, speakers and more. Whether you require in-ceiling and surface mount speakers, or assistance routing audio through high quality speakers rather than projector or computer speakers, we’ll carefully ask the right questions to help you define exactly what you need – and nothing you don’t. From amplifiers, microphones, and background music, to paging systems for factories, ABC Audio Video can install a direct paging system and integrate it with most existing phone systems. 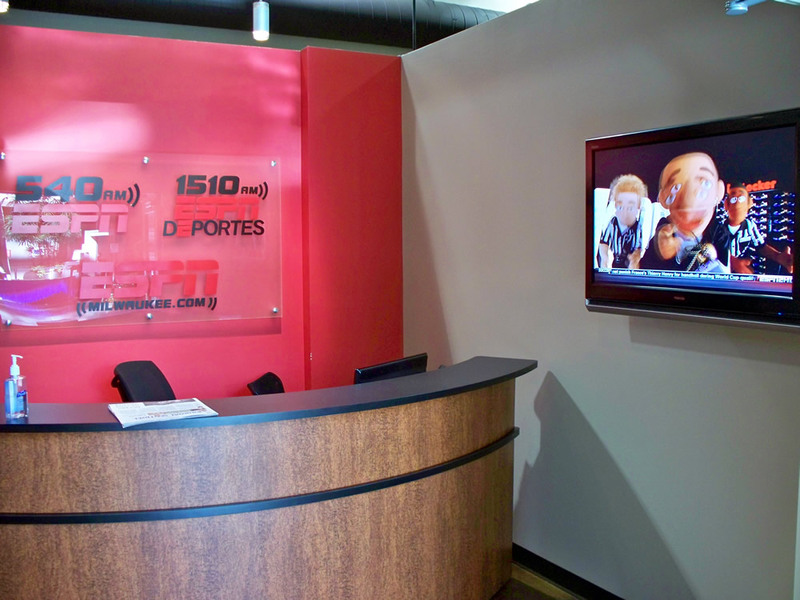 Whether your project involves new construction or an existing building, we can run data, phone, and audio/video wiring throughout your space. Is your Wi-Fi slow and unreliable? 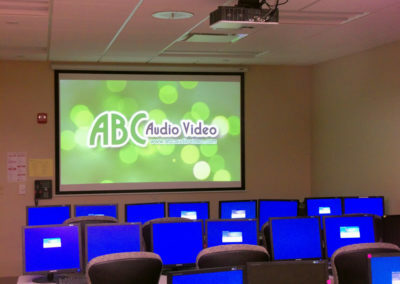 ABC Audio Video can install commercial grade, high-performance Wi-Fi systems along with gateways and access points, to boost your signal and provide your organization with Wi-Fi where you need it most. Please note that internet speed is determined by your ISP not ABC Audio Video. While we strive to offer the best system performance, some things are outside of our control. Are too many remotes clogging up your work space? 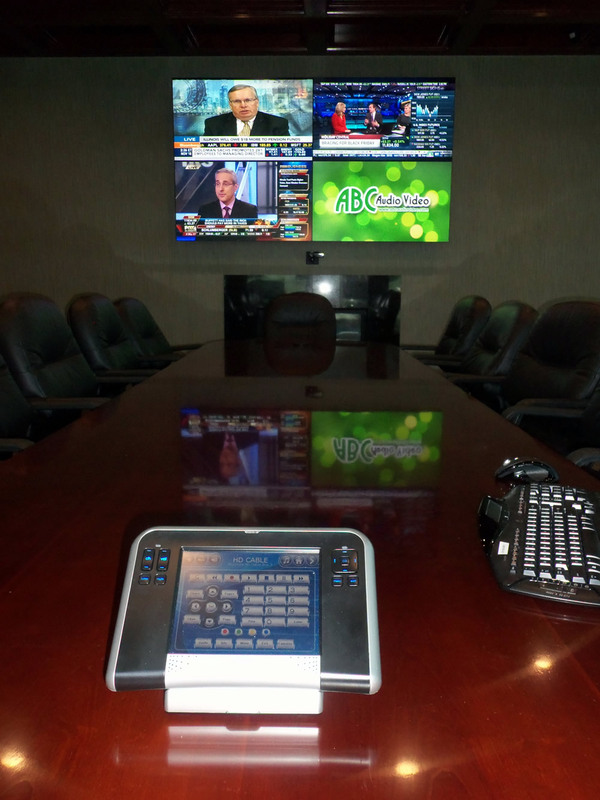 ABC Audio Video can supply and configure portable or desktop touch panel control systems for existing systems. For an economical option, we can alternatively install touch screen and/or 8- button, wall mounted keypad controls. No matter what your budget or project size, we’ll help you with all your audio/video needs and ensure the project is simply done right! It’s never too early to contact us. 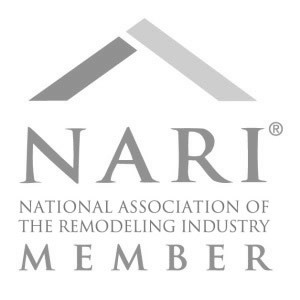 Ideally, it is best to contact us well before drywall. All too often, we are the last trade brought into a project and if we aren’t contacted early enough, limitations may exist – due to construction phases. Do you help with system design? Yes we do. Contact us today to discuss your project. 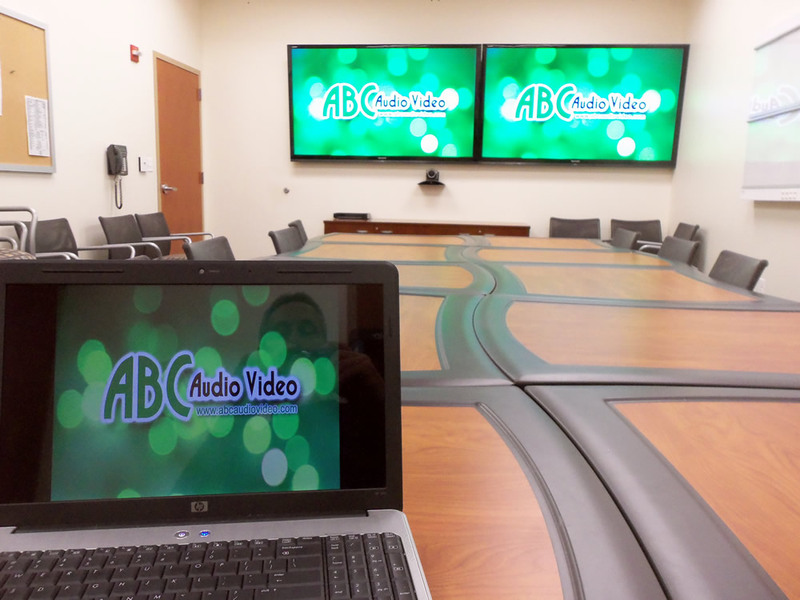 The planning phase is the perfect time to get ABC Audio involved so you don’t run into unexpected limitations down the road. 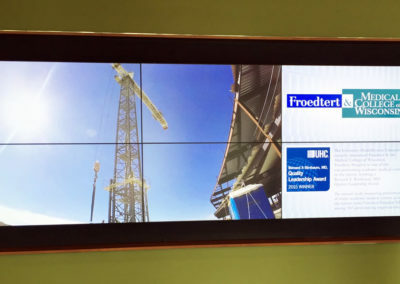 We take into consideration your goals, conferencing needs, multiple screen requirements, touch panel control systems and more to ensure all your audio/video needs are met or exceeded. What size TV do I need? That depends. There are many factors that contribute to the appropriate answer to this question, including room size. A cookie cutter answer is not the right approach. 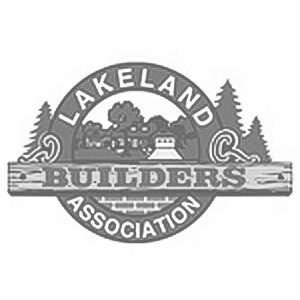 Contact us today and we’d be happy to discuss your project. This gives us the opportunity to discuss the different variables that may impact this important decision. Should we get a projector and screen or TV? Similar to determining the size of a TV, the decision of projector vs. TV requires several important factors for consideration. For example, often times, training rooms work well with projectors because they are deeper and larger, but this is not always the case. Lighting and budget are also important factors as well. Contact us today and let us help you determine the best approach for your unique set of needs. How long will my A/V project take? 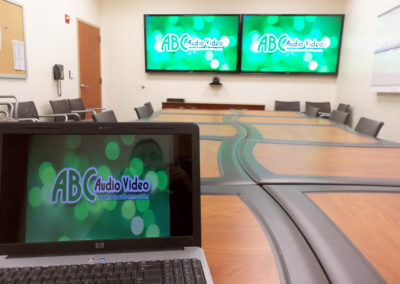 Most A/V conference room projects are completed in one day. Lead time ultimately depends on complexity, but typically ranges from 1-4 weeks. Yes, we will gladly install your own equipment. 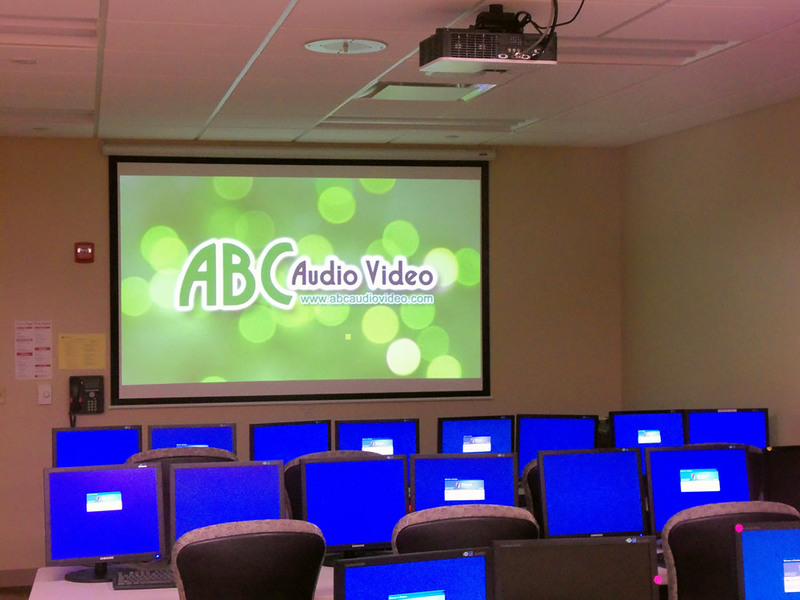 At ABC Audio Video, we can often provide competitive pricing on electronic components, but if you have existing equipment, we are happy to install it for you, provided it will help you best accomplish your goals. Please note that ABC Audio Video may not be responsible for problems that arise from using existing equipment. 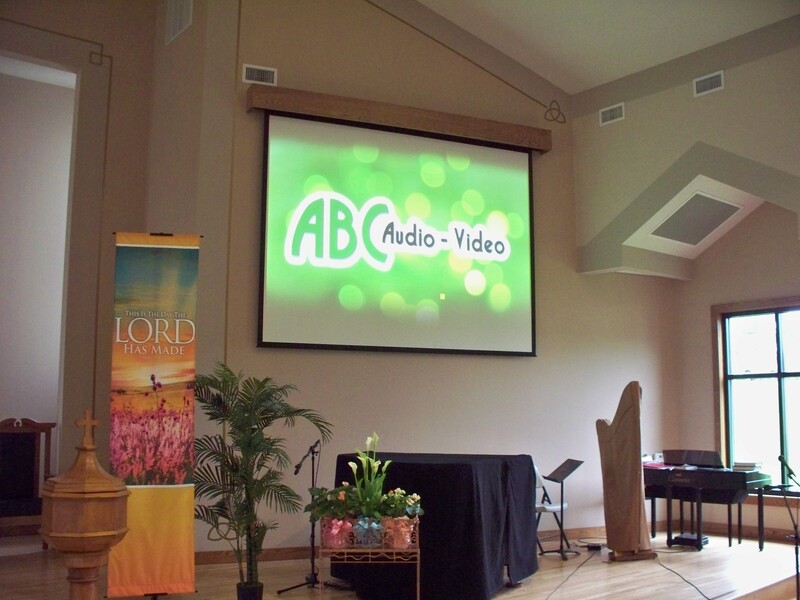 For over 10 years, ABC Audio Video has provided affordable audio and video solutions to commercial customers of all sizes.